If you're ono for some real local food, Marujyu Market is the place for you. Choose from combo plates with one, two or three choices. 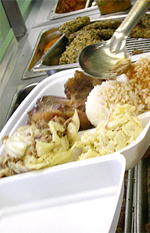 All combo plate lunches come with two scoops of rice and one scoop of macaroni salad. You can also choose a mini plate. What makes Marujyu Market unique is that you can purchase any item by the pound. So on those busy days when you don't have the time to cook at home, just stop by and pickup something for the family or just for two. You can cook the rice at home or take it with you. We have many everyday items and weekly specials to choose from and if you really want to make it special, pickup some poke or pupu at the same time. If you are in a hurry, just call 487–0057 and place an order. We'll have it ready when you get here. Click to view the daily menu. Click to view the specials of the day.